EMPLOYERS. They're the ones who don't let you go home on time. Or insist that you show up in the office, even when you can log on from home. Or call you back on weekends, just as you're about to take your family out. Why, they're the biggest culprits in keeping you from your family. And therefore, they should be the ones to change. 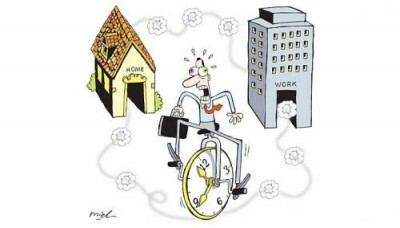 At least, that's the idea that seems to be emerging in the ongoing debate on work-life balance. Employees have been pointing the accusing finger at employers, whom they say should make the necessary changes to be more family-friendly. And the Government, mindful of the potential impact of enforced measures such as legislation, appears to be favouring a softer approach of convincing employers to have a "mindset change", as it mulls over options like mandating paternity leave. And of course that will happen eventually. Bosses will one day come round on their own to see that employees who get to spend more time with their families will be happier and therefore be more productive at work. And so they will allow their employees to work flexi-hours, work from home, and take longer childcare and parental leave. Seriously - how many profit- minded, bottom line-driven bosses will willingly acquiesce to seeing less of their workers at their workstations? Of course, bosses will benefit in the long run, as numerous studies have shown. Companies from Hewlett-Packard to IBM have found that enlightened human resource policies have resulted in more motivated and productive workers, fewer days of medical leave and lower staff turnover. But try telling that to a small or medium-sized enterprise (SME), with fewer than 10 workers, struggling to keep afloat or which is already short on staff. The fact is, employers often come to realise the benefits of work-life balance only after they are forced to make the change. There are many such examples in Europe and Scandinavia, seen by many as the home of enlightened employers. The truth is, this is as much to do with numerous laws designed to protect workers' family time. Sweden, for instance, has a Working Hours Act and Parental Leave Act. Other countries in Europe and states in America have all sorts of laws to limit working hours, mandate parental leave, give workers the right to request for flexi-time, or protect women from discrimination when they return to work after maternity leave. Singapore too has had to enact the Retirement and Re-Employment Act, to require employers to hire older workers and enforce four months of maternity leave. Few firms would have done it voluntarily. The point is, to a large extent, family-friendly measures may benefit the nation - higher employment and hopefully higher birth rates - but not necessarily individual companies. And if we go by the basics of economics, no company will make a change that does not benefit it enough. Only when compelled by legislation or strong external factors such as manpower and skill shortages are companies likely to tweak their human resource practices in order to recruit and retain talent. Case in point: Many of the companies well known for their family-friendly policies are in the technology industry because the demand for talent there is high and that talent demands work-life balance. Likewise, progress on raising wages, lowering reliance on foreign labour and raising productivity has been slow unless governments force employers' hands. But laws also have their limits, as countries like Japan and those in Europe have found out. Often, they are weakened by cultural norms or economic circumstances. In Japan, national laws and policy cannot stop workers from working extra hours - for which they are not paid - because they believe their bosses will penalise them if they don't. In Germany and New Zealand, recessions have made employees less likely to ask for flexible work arrangements in case it affects their job security. Given Singaporeans' penchant for kiasuism - a No.1 trait, going by a recent survey of Singaporeans' perceptions of themselves - workers here could go down the same path. So what can we do to get some work-life balance? With the current economic uncertainty and the risks of legislating these practices, are Singaporeans doomed to working long hours and seeing little of their families? I believe the answer is ultimately up to us. If we believe that we can change government policies through feedback and pressure - and our votes - then I believe we can change employers' practices by voting with our feet, too. We've often seen how power shuttles back and forth between employer and employee, depending on the labour market. In a tight market, it's the employers who are the price takers. With the population ageing, birth rates dropping and the supply of foreign workers being tightened, the increasing shortage of manpower should hand more market power to employees. If this can apply to wages, why not work-life policies? Imagine a future in which companies have little choice but to offer flexi-hours, flexi-work arrangements and paternity leave, simply because workers expect it. No flexi-time? Sorry, no workers. Such pressure, however, can be effective only when each and every employee makes such demands on the workplace, like we now do for, say, transport to ferry home workers on the graveyard shift. And it will need the backing of legislation, to provide some formal framework and national standards for work-life provisions. Perhaps such a scenario is a little idealistic - but dare I say, not much more idealistic than expecting employers to all turn compassionate. Not that I'm advocating revolution, of course. Unions can play a critical role here, going beyond "mindset change" goals to make family-friendly practices part of their collective agreements. Again, that will work only if employees across the board value work-life balance enough to turn down a job that lacks it. That would probably seem a little too much to ask now, especially for those struggling to make ends meet. But perhaps it's also because work-life balance, at the end of the day, is still a somewhat alien concept to many of us raised in a society that seems to place greater value on work than family. So it may take a bigger, deeper cultural change in attitudes towards work before employees as a group can put enough pressure on their bosses. Admittedly, it will also be harder for workers in small companies, where they are not likely to be unionised and hence have less clout. But we're not asking for a revolution. We're asking for slow but sure changes. So the laws will need to be tweaked bit by bit, and we too, will need to send our bosses the message, bit by bit.